Achieving national renown as a mural and easel painter, Jenne Magafan spent the early part of her life in Colorado. However, in the 1930s, she was in northeast Nebraska where she created a post office mural for the town of Albion. Jenne was then living in Denver with her parents and twin sister, Ethel, who, like Jenne, was receiving much attention for her artistic abilities and also becoming involved in a mural project in Nebraska. The Magafan sisters were born in Chicago in 1916 to Julia Bronik Magafan, of Polish ancestry, and Petros (Peter) Magafan, a Greek who had immigrated to Illinois. Due to his health, the family relocated shortly after the birth of the girls to Colorado, first to Colorado Springs and then to Denver. Petros Magafan “was unusual in that he encouraged his daughters’ interest in art.” (Smith 280) He also had a strong attachment to the western landscape of Colorado because it reminded him of his home village in Greece. By the time the twins were teenagers, they were entering art exhibitions. Jenne, at age 18, began entering exhibitions at the Denver Art Museum in 1934 and continuing in 1935 and 1938 to 1942. Jenne and Ethel were both dedicated to making fine art their life-long professional commitment, but making a living in the 1930s was a big challenge because it was the depth of a severe economic depression. However, a lifeline for the Magafans and several hundred other artists came from the federal government’s programs to combine community improvement with paid work. The program in which Jenne and Ethel were involved was the Treasury Relief Art Project (TRAP). It employed designers and laborers and resulted in 300 new community post office buildings. After their completion, the Treasury Section of Painting and Sculpture oversaw their ornamentation and held competitions among artists for designs. Jenne received the one for Albion, Nebraska and Ethel for Auburn, Nebraska. Making that adjustment, however, was a minor concern for Jenne compared to the overall challenge of ‘her’ post office since it was “one of the smallest and most modest of the Nebraska structures.” (Puschendorf 38) She had some experience from previously working on a public building mural project in Colorado Springs, but the interior of the Albion structure was much smaller. Also, she and the other post office muralists were constrained by federal specifications that mural colors needed to harmonize with other decorations in the building; that a sense of three dimensions on a flat surface should be conveyed; and that murals should not visually conflict with the large standardized globe lights hung from the ceiling. The mural was installed in 1936 with Jenne present as well as her future husband, artist Edward Chavez, and her sister Ethel Magafan. Apparently the work was well received as Jenne later referred to her pleasure with a “very swell trip to Nebraska” and to local people “who were terribly interested and enthusiastic with the idea of having a mural in their town. There was also the feeling that it was a great privilege that Washington should choose to give them a mural.” (Puschendorf 38) Administrators of the project indicated their pleasure with Jenne’s work by submitting her initial mural design sketch as part of an exhibition of mural studies at the Corcoran Gallery of Art in Washington, D.C.
From 1936 to 1938, after the Magafan sisters had completed their Nebraska murals, they attended the Colorado Springs Fine Arts Center thanks to Jenne who initially paid for both tuitions from a $90 Carter Memorial Art Scholarship she had received. However, the money covered only two months of classes, but instructor Frank Mechau, determined that these two talented women should remain in school, hired them both as paid assistants. With his skills as a muralist, focus on regional subjects, and modernist style, he had a lasting influence on Jenne and Ethel, as did instructors Boardman Robinson and Peppino Mangravite. The Fine Arts Center also continued to support the Magafans by entering their work in exhibitions in 1938, 1940, and 1941. Jenne won a total of seven mural commissions and, as a realist depicting subjects familiar to local people, she was much lauded as one of the leading American Scene painters of that era. In addition to Nebraska, her mural projects included Denver High School; the Social Security Building in Washington, D.C. with Ethel; Beverly Hills Hotel; Glenwood Springs (Colorado) Post Office with Edward Chavez; post offices in Anson, Texas and Helper, Utah; and a high school in Worcester, Massachusetts. She also had an active exhibition history including in 1940 and 1942 at the Kansas City Art Institute; San Francisco Museum of Modern Art, 1941, 1944, and 1946; and 1941 at Carnegie Institute in Pittsburgh, Pennsylvania; Boston Museum of Modern Art; and The Art Institute of Chicago. In 1942, her work was again exhibited at The Art Institute, and also at the Metropolitan Museum of Art and Museum of Modern Art, both in New York City, and the National Gallery of Art in Washington, D.C. That same year she received the Peixotto Memorial Prize for excellence in mural painting, named in memory of American muralist Ernest Peixotto. In 1951,”all four went to Europe, Ethel having received a Fulbright Award for the study of Byzantine and Grecian art, and Edward, holding a Fulbright to paint in Italy.” (Smith 280) It was a happy year of travel, including a trip by Jenne from Italy to visit her sister in Greece. “During that year in Italy, Jenne completed many powerful paintings of the structures and people inspired by that environment.” (Currie) In 1952, the couples returned to the States, and less than a week after their return, Jenne died in an Albany, New York hospital of a cerebral hemorrhage. Ethel was devastated, apparently a tragedy from which she never recovered. She named her only child, a daughter born four years later, Jenne Magafan Currie, and from that time, her paintings were more abstract and emotion driven. In 1953, the Woodstock Artists Association and Ganzo Galleries of New York held memorial exhibitions in honor of Jenne Magafan, and in the summer of 2006, the Woodstock Artists Association and Museum held an exhibition titled The Magafan and Currie Clan: A Family of Artists. The exhibition was solely one of paintings and works on paper by Jenne Magafan, Ethel Magafan, Bruce Currie, and paintings and sculpture by Jenne M. Currie. 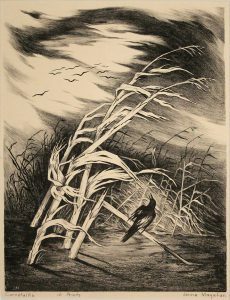 The Museum of Nebraska Art has one work by Jenne Magafan, a lithograph titled Cornstalks. Currie, Jenne Magafan, niece of Jenne Magafan and daughter of Ethel Magafan and Bruce Currie. In an email of December 16, 2016 to Lonnie Dunbier, she provided both additional and clarifying information for the Jenne Magafan biography including the list of solo exhibitions.